Welcome to His Place Eatery, a full-scale Soul Food and BBQ restaurant that puts a gourmet twist on down-home cooking. Located at 30th and Shadeland Avenue on the east side of Indianapolis, His Place Eatery is a unique experience in Soul Food. Built on the Idea that Soul Food can be served in a unique way with flare, His Place Eatery is the brainchild of Chef James “Mackie” Jones and wife Shawn who both believe that “Good Food” is universal. Whether it’s called Soul Food, Down Home Cooking, or Southern Cooking, people want to experience First-Class food. With a formal culinary education and more than a decade of catering experience under his belt, chef James carefully hand-crafted each and every recipe, dry rub and seasoning—earning His Place Eatery a place among the best soul food restaurants on the Indy A-List for four years. With an expansive menu, service with a smile, and a welcoming environment, His Place is Indianapolis’ premier place for soul food. It’s simply good food. 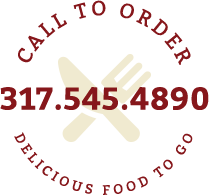 We specialize in traditional and gourmet selections. Follow us on social media and share the love!